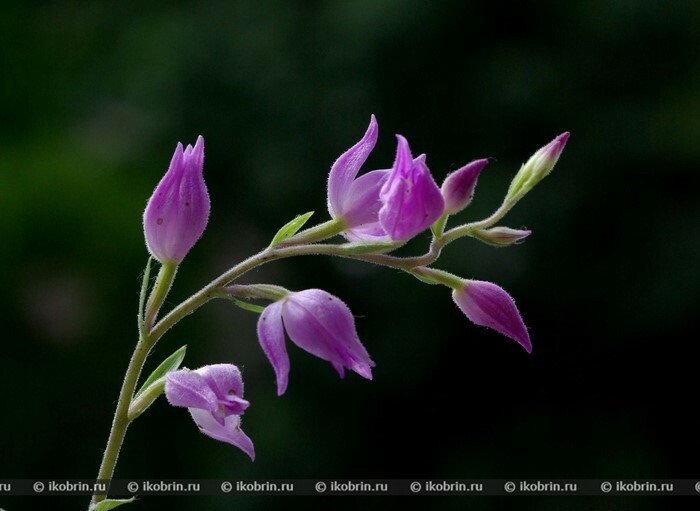 Look: CEPHALANTHERA RUBRA (L.) RICH. For the first time under the state protection in the republic it is taken in 1964. It is included in the Red List of Belarus of the 1st and 2nd editions (1981, 1993) and the Red List USSR of the 2nd edition (1984). It is protected in Ukraine, the Smolensk Region of Russia, Poland, Lithuania and Latvia. It is entered in the Appendix II to the Convention SITES. Perennial grassy korotkokornevishchny plant with a direct oblistvenny stalk from 25 to 60 cm high. Leaves oblong lantsetnye or lantsetny, pointed, next, on 5-8 on a stalk. Flowers large, pink-lilac, on pedicels, are collected in friable kolosovidny not multiflowered (2-8 flowers) an inflorescence. The lip is whitish, with treugolno the pointed top blade. A stalk, an axis of an inflorescence, a pedicel and an ovary with small ferruterous omission. A fruit - a dry spindle-shaped box with very small numerous seeds. Atlantic, Central and Eastern Europe, Scandinavia, Mediterranean, Asia and Central Asia, Iran. Relic, by origin the South European not moral look which is in Belarus on northeast border of an area. The majority of the known locations is revealed in the southern and central districts of the republic. Meets in Berezovsky, Brest, Gantsevichsky, Ivanovskoye, Kamenetsky, Kobrinsk, Luninetsk, Maloritsk, Pinsk and Pruzhansk districts of the Brest Region, in the Babruysk, Kirov, Osipovichsky and Cherikovsky districts of the Mogilev Region, in Lelchitsky, Mazyr, October, Recyca, Hoyniksky and Chechersky districts of the Gomel Region, in Borisovsky, Dzerzhinsk, Kletsky, Lyubansky, Myadelsky, Pukhovichsky, Smolevichyosky, Starodorozhsky and Chervensky districts of the Minsk Region, in Volkovyssky, Zelvensky and Svislochsky districts of the Grodno Region. The most northern place of growth is revealed in vicinities of. Rozhno in the Berezinsky biospheric reserve (The Vitebsk Region, the Lepelsky Yo district). According to literary and gerbarny data it was noted in Braginsky district of the Gomel Region, vicinities Trickled pastries, Minsk, Mogilev, Nesvizha and Novogrudk. The broad-leaved, coniferous and broad-leaved, secondary small-leaved woods, among bushes. Blossoms in June - July, fructifies in July - August. Entomofil. Reproduction seed (mainly) and vegetative. Anemokhor. At approach of adverse conditions the long time can lead an underground life (till 20 years). In all known locations number is insignificant; meets single individuals and small groups. Continuous cabins of the wood, economic transformation of lands, excessive pasturage of cattle and recreational loadings (collecting the blossoming plants on bouquets, trampling). "Bialowieza Forest" and "Narochansky", in wildlife areas "Svityazyansky" (Novogrudsky district), "Pekalinsky" (Smolevichsky district), "The castle wood" (Volkovyssky district), "Pribuzhsky Polesia" (The Brest district), "Obrovo" (The Ivanovo district), "Klevitsa" (Oshmyansky district), "Izin" (Pinsky district), "Luninsky" (Luninetsky district), "Lukovo" (Maloritsky district), "Sporovsky" (Berezovsky the district), "Zavishye" (The Ivanovo district) grows in territories of the Berezinsky biospheric reserve, national parks. Audit and periodic control of a condition of the known populations, search of new places of growth and, if necessary, the organization of their protection are necessary, will lock or restriction in places of growth of anthropogenous influences, introduction of a pyltsegolovnik red in culture as an ornamental plant.